nYlt [email protected] PSF .0224 .0392 .0737 .0894 .0238 .0962 .0737 .0894 .0238 .0343 .0737 .0894 .0238 .0794 .0737 .0894. BSF .0007 .0046 .0039 .0019 .0090 .0039.
the Riksbank staff for their assistance in data collection and Kevin Daly for informative ... There was some recovery during 2005, with an ... (the so-called capital account balance) and errors and omissions that drive a wedge between. Keywords clause-initial, cleft, discourse pragmatics, expletive, German L1, .... initial position of L2 learners of a Germanic V2 language, we have some ... parameters or constraints on which constituent orderings are possible irrespective ..... (8) [Context: Divers discovered a sunken vessel off the Swedish coast last year.]. Bohnacker, Ute. 2010. The clause-initial position in L2 Swedish declaratives: Word order variation and discourse pragmatics. In Ute Bohnacker & Marit Westergaard (eds. ), The Nordic Languages and Second Language Acquisition Theory, special issue of Nordic Journal of Linguistics 33(2), 105–143. 1. INTRODUCTION This paper investigates the interaction of word order and discourse-pragmatic constraints concerning the clause-initial position of declaratives in the advanced second language (L2) Swedish of native German speakers. vocabulary) are also investigated for the same learner(s), which is rarely done. It is also an open question whether L2 discourse-pragmatic problems are surmountable at advanced proficiency levels, or whether they are inevitable and prone to fossilising.2 Concerning the topic of the present paper, namely word order variation in the clauseinitial position of L2 learners of a Germanic V2 language, we have some indication of discourse-pragmatic problems in advanced learners, but we do not know whether delays in this domain can eventually be overcome. This is because so far only tutored foreign language learners have been studied who had up to six years of classroom training in their home country (Ros´en 2006; Bohnacker & Ros´en 2007, 2008). The learners had not spent any extended period of time in a naturalistic L2 environment. One therefore wonders whether the observed transfer of L1 information-structural patterns would have persisted if the learners had been exposed to larger quantities (and possibly higher quality) of input in the target language. The present study of advanced native German learners of Swedish who have been immersed in the target language for three, six and nine years may be a first step towards answering this question. This paper is set up in the following manner: Section 2 discusses different approaches to the interaction of word order and discourse pragmatics. Section 3 extends and applies this discussion to the prefield in Swedish and German. Section 4 provides background information on informants and data collection. In Section 5, quantitative and qualitative results are provided on how German-speaking learners of Swedish after three, six and nine years of exposure vis-`a-vis native speakers make use of the prefield, concerning subjects and expletives as well as objects. Section 6 offers concluding remarks. ¨ ¨ Figure 1. Buhler’s communicative triangle (Buhler 1934:28). its potentially universal or language-specific information-structural influence on constituent ordering. Information structure concerns the division of information into more or less salient or relevant and its packaging and presentation with the help of linguistic structure (e.g. Chafe 1976; Prince 1981). The information structure of a particular utterance very much depends on the context that utterance occurs in. Speakers/writers structure utterances according to what they regard as the main point of the utterance and what is being said about what. They also make assumptions about what listeners/readers know and what they are thinking about. They linguistically encode the degree to which they regard the content of what they say to be accessible to the listener, and structure and present information accordingly. Research on information structure is characterised by a bewildering heterogeneity in terminology. Perhaps the most widely used notions are topic and focus, where topic is often defined in terms of aboutness or as information already presented in the context, and focus is often defined in terms of new or prominent information. However, many scholars do not offset topic against focus but regard the two as a conflation of different levels, necessitating other notions beyond topic and focus at several distinct levels of information structure (e.g. Krifka 2007:41). I share this view and will assume that there are three separate levels of information structure. Here it is worth reminding ourselves that the way we view information structure depends on our model of communication. A widely known model is B¨uhler’s (1934:28) communicative triangle in Figure 1, where content (Gegenst¨ande und Sachverhalte) is communicated by the sender (Sender) to the receiver (Empf¨anger). outside the grammar proper, e.g. to pragmatics, rhetoric or stylistics (Liceras 1988). Nowadays, they tend to be described as syntax–pragmatics or syntax–discourse interface problems. Alternatively, they are argued to arise within the computational system itself – as representational deficits in functional categories or in features associated with these categories (e.g. Valenzuela 2006; Belletti et al. 2007:659, 676), but to do so makes sense only within a cartographic theory that assumes discoursepragmatic features to exist in the syntax. On an autonomous-syntax view no such features are part of the syntax. So it seems to me that there is no theory-neutral answer to the question whether L2 learners have greater problems at grammarexternal interfaces than at grammar-internal interfaces, and whether the problems are pragmatic or grammatical in nature, since the answer very much depends on the formal theory of syntax adopted. Figure 2. Overt constituents in the prefield, written L1 data (Bohnacker & Ros´en 2008). Figure 3. Overt constituents in the prefield, oral L1 data (J¨orgensen 1976; Bohnacker corpus). A similar asymmetry can be found in informal speech (Figure 3). I show this for a corpus of colloquial spoken German that I collected and transcribed myself (see Section 4 for details) and a spoken Swedish corpus from the Talbanken project at Lund University (J¨orgensen 1976). Again, Swedish has a stronger subject-initial preference (62%) than German (50%) and fronts adverbials less often (22%) than German (37%), though there appears to be no pronounced difference concerning the frequencies for fronted objects (14%, 12%) in the spoken data from the two languages.8,9 These differences in frequency between Swedish and German led Ros´en and myself to investigate the prefield in the two languages more closely. We were struck by the fact that Swedish speakers more often than German speakers placed phonologically light elements in clause-initial position, especially elements that had low or no informational value. Concerning subjects, it was particularly interesting to see that expletive det ‘it’ in the prefield in Swedish was much more frequent than expletive es ‘it’ in German. In Ros´en’s (2006) corpora of informal letters, 22% of all subject-initial sentences begin with an expletive in Swedish, but only 11% in German, as shown in Table 1. This difference is significant (X2 = 48.00, p < .001). Interestingly, the same asymmetry concerning expletive subjects can be found in informal speech (Table 2). I compare two corpora of spoken Swedish (J¨orgensen 1976) with new corpus data from spoken colloquial German (Bohnacker corpus). In the two Swedish corpora, 16% and 19% of the subject-initial declaratives start with an expletive, but in the German data only 3% do so. The difference between the Swedish and German data is again significant (X2 = 221.08, p < .001). Table 1. Expletive subjects in the prefield, written data, informal letters (Bohnacker & Ros´en 2008:520). Note: J¨orgensen A corpus – conversations and discussions between academics; J¨orgensen B corpus – informal interviews; Bohnacker corpus – colloquial spoken German (see Section 4.2 below). Table 2. Expletive subjects in the prefield, informal oral data (J¨orgensen 1976; Bohnacker corpus). Constituents other than subjects in the prefield would also deserve to be properly investigated (see Bohnacker & Ros´en 2007), but due to space constraints I cannot do so here but only make a brief comment concerning objects. The definite inanimate pronoun det ‘it/that’ is by far the most common fronted object in Swedish, a fact that has also been noted in previous corpus studies (e.g. Rahkonen 2000, 2006). Such det is more frequent in the prefield than its German equivalent das ‘it/that’. German speakers front a wider range of objects, both lexical and pronominal. For instance, in the informal written L1 texts collected by Ros´en, det makes up 82% of all fronted object pronouns, but das only 24% (Ros´en 2006:99–102). Such a large gap does not exist for fronted object det and das in the oral data, but it still is the case that native German speakers front a wider range of objects than the native Swedes do, including personal pronouns and lexical noun phrases. The precise percentages of elements in the prefield (see Figures 2–3 and Tables 1–2) may be different for corpora of other text types, but my point here is that when keeping genre constant, there is a clear asymmetry between German and Swedish. I will argue that this is likely to be due to different tendencies in the two languages concerning the mapping of syntax and information structure. the topic identified by the speaker, about which s/he then provides information (Reinhart 1982; Lambrecht 1994: Chapter 4; see Section 2 above). Processes of thought and communication motivate strategies by which the speaker as well as the listener identifies the topic as early as possible. Yet this does not mean that the prefield is a slot reserved for topics; topics can also occur elsewhere and many adverbials that are non-topics occur in the prefield as well. As regards theme and rheme, both Swedish and German have a tendency towards given before new, a tendency attested for many languages, which again may have to do with ease of online processing. This tendency, coupled with the V2 constraint of the two languages, gives rise to clauses where the prefield contains an element of low informational value. New (rhematic) information is usually provided later, after the finite verb (see Daneˇs 1970; Beneˇs 1971; Ekerot 1979; Hoberg 1981:174–176; Ekberg 1997:105–106; Zifonun et al. 1997:1640–1643; Teleman et al. 1999:53–64). Alternatively, the prefield may also host a focused element that the speaker wants to draw particular attention to, coded prosodically via stress and pitch contours (see e.g. Zifonun et al. 1997:1641–1642). The focused element may or may not be contrasted with other members of some evoked set of alternatives (recall note 3). Both Swedish and German mark focus by prosodic prominence and this can be done anywhere in the clause, so the prefield cannot be considered a designated focus position. These observations are not new and suggest that the two languages are information-structurally similar: There are certain word order tendencies, but little evidence for any DIRECT impact of information structure on Swedish and German syntax. Neither language appears to have a fixed slot for elements with a particular information-structural function, in contrast to what has sometimes been argued for other languages, such as a preverbal focus position ´ Kiss 1998:170–171; see F´ery 2007 for an alternative in Korean or Hungarian (e.g. E. view). Note that the Swedish clefts in (6)–(8) are not contrastive: Clefted n˚agon ‘somebody’ in (6) is not contrasted with some other person who doesn’t want to see the addressee. There is no contrastive or minimal focus on n˚agon. Rather, the information provided in (6) is all new, with maximal focus on the entire cleft sentence (n˚agon som vill tala med dig). Similarly, the clefted constituent f¨orst i juni i a˚ r ‘only this June’ in (8) is not contrastive, it does not carry minimal focus, but rather, the entire cleft sentence in (8) is new information. Similar ‘all-new’ clefts also regularly occur in English, Norwegian and French (see e.g. Hedberg 2000; Gundel 2002; Robach 2003). a. ?Henne har jag redan fr˚agat. her have I already asked b. Jag har redan fr˚agat henne. 6,140 for the oral data. The learners placed the finite verb in a targetlike manner, with only 0.026% violations of the V2 constraint (Bohnacker 2007:24–26). 4.2 Native speakers The native informants are adults and roughly of the same age group as the L2 learners. L1 text types have been matched as closely as possible with those of the L2 learners. The written L1 corpora comprise compositions (informal letters, summaries) by 70 native speakers of German (28,500 words) and 80 native Swedish speakers (17,500 words), and were collected by Christina Ros´en between 1999–2005 (see Ros´en 2006). The oral L1 data consist of conversations between native speakers that include both dialogue and more monologue-like narrative passages. Here I am using a new, previously unpublished corpus of oral native German, which contains 30,700 words of colloquial South German dialogue (Bohnacker corpus). Three female informants age 25–35 and three age 60–70, all from the greater Ulm area, were recorded for four hours in one-to-one conversations with a local experimenter.15 The recordings were made between 1994 and 2000 and transcribed by myself. Word order and constituent type were manually classified and coded. For Swedish, I perused J¨orgensen’s (1976) corpus study of recordings made in 1968. This includes (i) conversations and discussions between academics (8 informants, 3 hours of recording, J¨orgensen A), and (ii) 32 informal interviews of 30–45-year-old employees on the topic of immigrants and immigration (8–9 hours of recording, J¨orgensen B). The conversations and discussions comprise 11,200 words, and the interviews 45,000 words. These data were collected and analysed as part of the Lund University Talbanken project during the 1970s. I noted J¨orgensen’s (1976) counts but also carried out manual searches of a 30,700-word portion of the informal interviews, comparable in size to the oral native German data. Figure 4. Prefield subjects and expletives in L1 German, L2 Swedish and L1 Swedish, informal written data (letters). Figure 5. Prefield subjects and expletives in L1 German, L2 Swedish and L1 Swedish, informal speech. Table 3. L2 expletive subjects in the prefield, informal written data. Table 4. L2 expletive subjects in the prefield, informal oral data. Figure 6. L2 expletive subjects in the prefield, informal speech. Over the years, the proportion of expletive-initial declaratives increases manifold, from 3% at 3 and 6 years in the written data to 7% at 9 years and from 2% at 3 years in the oral data to 11% and 16% at 6 and 9 years, respectively. I suggest that this change is indicative of the learners’ growing awareness of the Swedish frequency distributions and information-structural patterns, with a strong preference for rhematic information being placed later in the clause. The increased use of clauseinitial expletives achieves just this. 5.2 Objects In general, the learners produce more clause-initial objects than native Swedish speakers do, as shown by the black bars in Figures 7 and 8. They do so significantly more in their writing (Figure 7) than in informal speech, where the difference between learners and native Swedes is not significant (Figure 8). Recall also that informal spoken Swedish does not exhibit fewer fronted objects than German does, only fewer types of fronted objects. (Exact figures are provided in the appendix.) The white bars in Figures 7 and 8 represent det-initial clauses and will be discussed shortly. Figure 7. Prefield objects and object det/das in L1 German, L2 Swedish and L1 Swedish, informal writing. Figure 8. Prefield objects and object det/das in L1 German, L2 Swedish and L1 Swedish, informal speech. After three years of immersion in a Swedish-dominant environment, the learners seem insensitive to the subtle interpretive effects of placing objects in clause-initial position, or the left periphery of the clause.18 But again there is development over time. At 6 and 9 years, fronted animate pronominal objects have nearly vanished from the oral data, while occasional instances can still be found in the written learner data, such as that in (22). syntax might be, where only one specific word order is grammatical (e.g. VO vs. OV, V2 vs. non-V2), or morphology, where a particular inflectional morpheme is obligatory and others are ungrammatical. Discourse-driven word order patterns are also largely ignored in descriptive grammars, teacher training and language teaching materials. My guess would be that residual L1 patterns show more strongly in the L2 writing because writing is what these learners of Swedish do the least – their acquisition and immersion has been mainly oral and aural (see Section 4 above). The learners in this study do better than Bohnacker & Ros´en’s (2008) learners of the reverse language combination. This is likely to be an effect of increased exposure (input) during their three and six or more years in a dominant L2 environment vis-`avis foreign language classroom learning for a maximum of six years in Bohnacker & Ros´en’s study. Even though it is impossible to measure input exactly, Bohnacker & Ros´en’s advanced group can be estimated to have received 1800–2000 hours of input during their six years of L2 studies. By contrast, even on a conservative estimate of only four daily hours of exposure for 300 days per year, the advanced learners in the present study would have had 3600 hours of communication in Swedish by three years, and 7200 hours by six years. (The actual number of hours is likely to be substantially higher.) The quality of input may also play a role. Taught foreign language learners (like Bohnacker & Ros´en’s informants) are almost invariably exposed to non-native input from their classroom peers and perhaps even at the level of instruction. L2 learners who receive naturalistic input in an immersion setting (as the informants in the present study) do not run that risk. Now how do the results presented here relate to recent empirical L2 studies mentioned in Section 1 on the acquisition of discourse-driven distribution of null vs. overt subjects and postverbal focused subjects in languages such as Italian and Spanish or referent introduction and maintenance in L2 German narratives? Common to them all is that learners at high proficiency levels continue to grapple with the pragmatically appropriate distributional pattern (e.g. Carroll & Lambert 2003; Carroll & von Stutterheim 2003; Hertel 2003; Lozano 2006; Sorace & Filiaci 2006; Belletti et al. 2007; Rothman 2009). Since in many of these studies the highest-proficiency group diverges from the native controls, some researchers have drawn the conclusion that information structuring in L2 acquisition never becomes fully native-like (e.g. Carroll & von Stutterheim 2003; von Stutterheim 2003; Sorace & Filiaci 2006; Valenzuela 2006:301). Other researchers have found that the performance of their most proficient learner group is not significantly different from that of the native controls concerning the particular phenomenon under investigation. They therefore conclude that while syntax–pragmatic difficulties may be persistent, these can be surmounted as proficiency develops (e.g. Rothman 2009). This is a hopeful conclusion and on the basis of the present study, I would concur with it. As for my initial discussion of interfaces in Sections 1 and 2, the learners in the present study, like those in other recent studies (e.g. Lozano 2006; Tsimpli & Sorace 2006; Belletti et al. 2007), master pure syntax (V2) well before they master the appropriate discourse-pragmatic use of that syntax. One might want to capture this with a cartographic approach, where the language-specific informationstructural differences and L2 problems would essentially be treated as SYNTACTIC and GRAMMAR-INTERNAL, and located inside the computational system (e.g. Belletti et al. 2007). In this case, we might assume ‘interpretable’ features such as [+Given/Theme], [+Focus] and corresponding left-peripheral functional projections corresponding to the prefield, with an interface mapping between these syntactic features and an interpretive component. The L2 learners could be said to have a representational deficit such that these features are underspecified (or specified differently), thereby allowing a wider range of possible mappings, e.g. both thematic and rhematic elements in the prefield, than native speakers do. I am not adopting such an approach here. One could also describe the results with a discourse-free theory of syntax (e.g. Prince 1998; Neeleman & de Koot 2008), where V2 is identical across languages, but where information-structural differences between Swedish and German and ensuing L2 problems are treated as PRAGMATIC and outside of grammar and purely located at an EXTERNAL interface with the conceptual-intentional system. To my mind, determining what constitutes internal and external interface problems in L2 acquisition seems to have a lot to do with one’s predilection for a particular formal theory of syntax, and not only with the empirical learner data. Thus, I will not take a stand on the interface issue here. What I have tried to show in this paper is that there are cross-linguistic differences concerning the relationship between word order and discourse pragmatics in V2 declaratives in Swedish and German and that learners – subtly but persistently – transfer discourse-related word order patterns from their L1 into the L2. In my view, this evidence for transfer can and should stand independently of any particular theoretical slant. I also hope to have shown that learners can overcome pragmatically inappropriate word orders at advanced proficiency levels, but that it takes much time and input to do so. ACKNOWLEDGEMENTS I would like to thank the anonymous and non-anonymous NJL reviewers, especially Christine Dimroth, for their positive comments and helpful suggestions. Thanks also to Christina Ros´en for fruitful collaboration and discussions at odd hours, and to the enthusiastic audiences in Barcelona, Canterbury, Lisbon, Lund and TromsP, where earlier versions of this work were presented. This research was partially supported by the Erik-Philip S¨orensen Foundation. Table A1. Constituents in the prefield, written L2 Swedish data, informal letters. Table A2. Constituents in the prefield, informal oral L2 Swedish. inanimate object in the prefield will not mislead the listener (but be processed as non-agent straightaway). As speakers want to ease communication, they will happily front subjects and inanimate objects, but shirk away from fronting animate objects and animate personal object pronouns. Rahkonen’s Swedish and Bouma’s Dutch results may be taken to support this idea, but they do not appear to carry over to German, since there animate objects do occur in the prefield, see e.g. Bader & H¨aussler (2010). TISUS (Test in Swedish for University Studies) is a two-day examination, testing reading comprehension, written composition, and oral communication in an interview with two examiners. Data collection at nine years after arrival was planned for two of these learners during 2010. The South German recordings were originally made with a different research topic (i.e. pronoun drop) in mind, but can also be investigated for clause-initial word order variation. The age difference between the 25–35 and 60–70-year-old informants might be a concern. I therefore analysed the productions of each individual separately, but could not detect any noticeable differences between the younger and older informants concerning the prefield. There are more subject-initial clauses (60%) in the learners’ oral data at 3 years than at any other data point. This is due to a preponderance of first person singular subjects (jag ‘I’) in some of the data files because of the way the interviewer interacted with the informant. Moreover, the learners’ choice of lexical items, grammatical gender and inflectional morphology sometimes differs from native Swedish. Such non-target features will not be commented on here. This is reminiscent of Camacho’s (1999) findings on L1 Peruvian Quechua speakers acquiring L2 Spanish. In Quechua, left-peripheral objects without clitics are informationstructurally ‘neutral’ (i.e. they do not evoke narrow/contrastive focus). Transferring this neutral L1 pattern to the L2, the learners produced objects without clitics in the left periphery in their Spanish, unaware that native Spanish listeners assign a contrastive focus reading to them that is unintended by the L2 speaker. It may, however, be the case that experiments that go beyond naturalistic production data would reveal a discrepancy between the learners and native speakers, e.g. with regard to acceptability judgments or processing in real time. This is a topic for future research. Thanks to Christine Dimroth for suggesting the term discourse accent. REFERENCES Ammann, Hermann. 1928. Die menschliche Rede. Sprachphilosophische Untersuchungen 2. Teil: Der Satz. Darmstadt: Wissenschaftliche Buchgesellschaft. Arnold, Jennifer E., Anthony Losongco, Thomas Wasow & Ryan Ginstrom. 2000. Heaviness vs. newness: The effects of structural complexity and discourse structure on constituent ordering. Language 76, 28–55. Bader, Markus & Jana H¨aussler. 2010. Word order in German: A corpus study. Lingua 120, 717–762. Behaghel, Otto. 1909/1910. Beziehungen zwischen Umfang und Reihenfolge von Satzgliedern. Indogermanische Forschungen 25, 110–142. Belletti, Adriana (ed.). 2004. Structures and Beyond: The Cartography of Syntactic Structures, vol. 3. New York: Oxford University Press. Belletti, Adriana, Elisa Bennati & Antonella Sorace. 2007. Theoretical and developmental issues in the syntax of subjects: Evidence from near-native Italian. 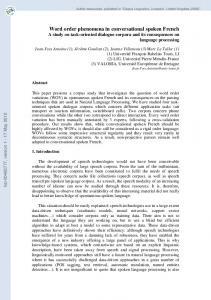 Natural Language & Linguistic Theory 25, 657–689. Beneˇs, Eduard. 1971. Die Besetzung der ersten Position im deutschen Aussagesatz. Fragen der strukturellen Syntax und der kontrastiven Grammatik, 160–182. D¨usseldorf: Schwann. Beninc`a, Paola & Cecilia Poletto. 2004. Topic, focus, and V2: Defining the CP sublayers. In Luigi Rizzi (ed. ), The Structure of CP and IP: The Cartography of Syntactic Structures, vol. 2, 52–75. Oxford: Oxford University Press. Bohnacker, Ute. 2005. Nonnative acquisition of Verb Second: On the empirical underpinnings of universal L2 claims. In Marcel den Dikken & Christina Tortora (eds. ), The Function of Function Words and Functional Categories, 41–77. Amsterdam: John Benjamins. Bohnacker, Ute. 2006. When Swedes begin to learn German: From V2 to V2. Second Language Research 22(4), 1–44. Bohnacker, Ute. 2007. On the ‘vulnerability’ of syntactic domains in Swedish and German. Language Acquisition 14(1), 1–43. Bohnacker, Ute & Christina Ros´en. 2007. How to start a declarative V2 clause: Transfer of syntax or information structure in L2 German. Nordlyd 34(3), 29–56. Bohnacker, Ute & Christina Ros´en. 2008. The clause-initial position in L2 German declaratives: Transfer of information structure. Studies in Second Language Acquisition 30(4), 511–538. Bouma, Gerlof. 2008. Starting a Sentence in Dutch: A Corpus Study of Subject- and Object-fronting. Groningen: University of Groningen. Brody, Michael. 1990. Some remarks on the focus field in Hungarian. UCL Working Papers in Linguistics 2, 201–225. B¨uhler, Karl. 1934. Sprachtheorie. Die Darstellungsfunktion der Sprache. Jena: Gustav Fischer. Camacho, Jos´e. 1999. From SOV to SVO. Second Language Research 15, 115–132. Carroll, Mary & Monique Lambert. 2003. Information structure in narratives and the role of grammaticised knowledge. In Christine Dimroth & Marianne Starren (eds. ), Information Structure and the Dynamics of Language Acquisition, 268–287. Amsterdam: John Benjamins. Carroll, Mary & Christiane von Stutterheim. 1993. The representation of spatial configurations in English and German and the grammatical structure of locative and anaphoric expressions. Linguistics 31, 1011–1041. Carroll, Mary & Christiane von Stutterheim. 2003. Typology and information organisation: Perspective taking and language-specific effects in the construal of events. In Anna Giacolone Ramat (ed. ), Typology and Second Language Acquisition, 365–402. Berlin & New York: Mouton de Gruyter. Chafe, Wallace L. 1976. Givenness, contrastiveness, definiteness, subjects, topics, and point of view. In Charles N. Li (ed. ), Subject and Topic, 25–55. New York: Academic Press. Chomsky, Noam. 1965. Aspects of the Theory of Syntax. Cambridge, MA: MIT Press. Chomsky, Noam. 1993. A Minimalist program for linguistic theory. In Ken Hale & Samuel Jay Keyser (eds. ), The View from Building 20: Essays in Linguistics in Honor of Sylvain Bromberger, 1–52. Cambridge, MA: MIT Press. Daneˇs, Frantiˇcek. 1970. Zur linguistischen Analyse der Textstruktur. Folia Linguistica 4, 72–79. Drach, Erich. 1937. Grundgedanken der deutschen Satzlehre. Frankfurt: Diesterweg. Dyhr, M. 1978. Die Satzspaltung im D¨anischen und Deutschen. Eine kontrastive Analyse. T¨ubingen: Narr. Ekberg, Lena. 1997. Diskursiva och syntaktiska m¨onster i a˚ terber¨attelser hos invandrarbarn i Roseng˚ard. In Gisela H˚akansson, Lena L¨otmarker, Lillemor Santesson, Jan Svensson & Åke Viberg (eds. ), Svenskans beskrivning 22. F¨orhandlingar vid Tjugoandra sammankomsten f¨or svenskans beskrivning Lund den 18–19 oktober 1996, 97–110. Lund: Lund University Press. Ekerot, Lars-Johan. 1979. Syntax och informationsstruktur. In Kenneth Hyltenstam (ed. ), Svenska i invandrarperspektiv, 79–108. Lund: Liber L¨aromedel. ´ Kiss, Katalin. 1998. Identificational focus versus information focus. Language 74(2), E. 245–273. Erteschik-Shir, Nomi. 2007. Information Structure: The Syntax–Discourse Interface. Oxford: Oxford University Press. Fanselow, Gisbert. 2007. The restricted access of information structure to syntax: A minority report. In F´ery et al., 205–220. F´ery, Caroline. 2007. Information structural notions and the fallacy of invariant correlates. In F´ery et al. (eds. ), 161–184. F´ery, Caroline, Gisbert Fanselow & Manfred Krifka (eds.) 2007. Interdisciplinary Studies on Information Structure 6, 161–184. Grewendorf, G¨unther. 1988. Aspekte der deutschen Syntax. T¨ubingen: Narr. Gundel, Jeanette K. 2002. 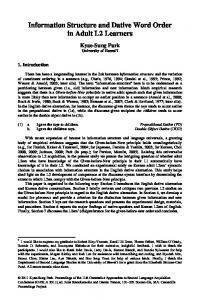 Information structure and the use of cleft sentences in English and Norwegian. In Hilde Hasselg˚ard, Stig Johansson, Bergljot Behrens & Cathrine Fabricius-Hansen (eds. ), Information Structure in a Cross-linguistic Perspective, 113–128. Amsterdam & New York: Rodopi. H˚akansson, Gisela. 1997. Barnets v¨ag till svensk syntax. In Ragnhild S¨oderbergh (ed. ), Fr˚an joller till l¨asning och skrivning, 47–60. Malm¨o: Gleerups. Halliday, M. A. K. 1967. Notes on transitivity and theme in English. Part 1 and 2. Journal of Linguistics 3, 37–81 & 199–244. Halliday, M. A. K. & Ruqaiya Hasan. 1976. Cohesion in English. London: Longman. Hawkins, John A. 1994. A Performance Theory of Order and Constituency. Cambridge: Cambridge University Press. Hedberg, Nancy. 2000. The referential status of clefts. Language 76(4), 891–920. Hertel, Tammy Jandrey. 2003. Lexical and discourse factors in the second language acquisition of Spanish word order. Second Language Research 19, 273–304. Hoberg, Ursula. 1981. Die Wortstellung in der geschriebenen deutschen Gegenwartssprache. M¨unchen: Hueber. Hockett, Charles. 1958. A Course in Modern Linguistics. New York: MacMillan. Huber, Stefan. 2002. Es-Clefts und det-Clefts. Stockholm: Almqvist & Wiksell. Hulk, Aafke & Natascha M¨uller. 2000. Bilingual first language acquisition at the interface between syntax and pragmatics. Bilingualism: Language and Cognition 3, 227–244. Jackendoff, Ray. 2002. Foundations of Language. Oxford: Oxford University Press. Jacobs, Joachim. 1984. Funktionale Satzperspektive und Illokutionssemantik. Linguistische Berichte 91, 25–58. Johansson, Mats. 2001. Clefts in contrast: A contrastive study of it clefts and wh clefts in English and Swedish texts and translations. Linguistics 39, 541–562. Johansson, Stig, 2007. Seeing through Multilingual Corpora: On the Use of Corpora in Contrastive Studies. Amsterdam & Philadelphia: John Benjamins. J¨orgensen, Nils. 1976. Meningsbyggnaden i talad svenska. Lund: Studentlitteratur. Kiese, J¨orn. 1993. Fokussierende S¨atze im Deutschen und Englischen. Frankfurt: Peter Lang. Krashen, Stephen. 2003. Explorations in Language Acquisition and Use. Porthsmouth, NH: Heinemann. Krifka, Manfred. 2007. Basic notions of information structure. In F´ery et al. (eds. ), 13–55. Kroll, Barbara (ed.). 2003. Exploring the Dynamics of Second Language Writing. New York: Cambridge University Press. Kuno, Susumu. 1987. Functional Syntax: Anaphora, Discourse, and Empathy. Chicago: University of Chicago Press. Lambrecht, Knud. 1994. Information Structure and Sentence Form: Topic, Focus and the Mental Representations of Discourse Referents. Cambridge: Cambridge University Press. Liceras, Juana. 1988. Syntax and stylistics: More on the pro-drop parameter. In James Pankhurst, Michael Sharwood-Smith & Paul Van Buren (eds. 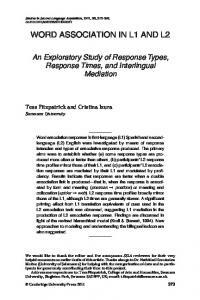 ), Learnability and Second Languages: A Book of Readings, 71–93. Dordrecht: Foris. Lozano, Crist´obal. 2006. Focus and split-transitivity: The acquisition of word order alternations in non-native Spanish. Second Language Research 22, 145–187. Mauranen, Anna. 1996. Discourse competence: Evidence from thematic development in native and non-native texts. In Eija Ventola & Anna Mauranen (eds. ), Academic Writing, 195–230. Amsterdam & Philadelphia: John Benjamins. Neeleman, Ad & Hans van de Koot. 2008. Dutch scrambling and the nature of discourse templates. 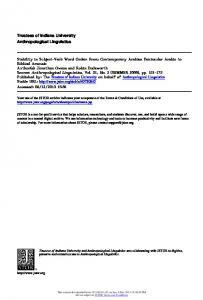 Journal of Comparative Germanic Linguistics 11(2), 137–189. P´erez-Leroux, Ana Teresa & William Glass. 1999. Null anaphora in Spanish second language acquisition: Probabilistic versus generative approaches. Second Language Research 15, 220–249. Platzack, Christer. 2001. The vulnerable C-domain. Brain and Language 77, 364–377. Polinsky, Maria & Robert Kluender. 2007. Linguistic typology and theory construction: Common challenges ahead. Linguistic Typology 11, 273–283. Prince, Ellen. 1981. Toward a taxonomy of given–new information. In Peter Cole (ed. ), Radical Pragmatics, 249–264. New York: Academic Press. Prince, Ellen. 1998. On the limits of syntax, with reference to left dislocation and topicalization. In Peter [W.] Culicover & Louise McNally (eds. ), The Limits of Syntax (Syntax and Semantics 39), 281–302. New York: Academic Press. Rahkonen, Matti. 2000. Topikalisering av icke-subjekt i svenska p˚ast˚aendesatser. Spr˚ak och stil 10, 37–85. Rahkonen, Matti. 2006. Some aspects of topicalization in active Swedish declaratives: A quantitative corpus study. Linguistics 44(1), 23–55. Reinhart, Tanya. 1982. Pragmatics and linguistics: A analysis of sentence topic. Bloomington, IN: Indiana University Linguistics Club, 1–38. Reis, Marga. 1980. On justifying topological frames: ‘Positional field’ and the order of nonverbal constituents in German. Documentation et Recherche en Linguistique Allemande Contemporaine 22/23, 59–85. Rizzi, Luigi. 1997. The fine structure of the left periphery. In Liliane Haegeman (ed. ), Elements of Grammar: Handbook of Generative Syntax, 281–337. Dordrecht: Kluwer. Robach, Inger-Britt. 2003. Satsklyvning i franska och svenska. In Eva Larsson Ringqvist (ed. ), Ordf¨oljd och informationsstruktur i franska och svenska, 45–72. V¨axj¨o: V¨axj¨o University Press. Rooth, Mats. 1992. A theory of focus interpretation. Natural Language Semantics 1, 75–116. Ros´en, Christina. 2006. Warum klingt das nicht deutsch? Probleme der Informationsstrukturierung in deutschen Texten schwedischer Sch¨uler und Studenten. Stockholm: Almqvist & Wiksell. Rothman, Jason. 2009. Pragmatic deficits with syntactic consequences? 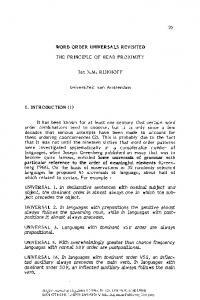 L2 pronominal subjects and the syntax–pragmatics interface. Journal of Pragmatics 41, 951–973. Siewierska, Anna. 1993. On the interplay of factors in the determination of word order. In Joachim Jacobs, Arnim von Stechow, Wolfgang Sternefeld & Theo Vennemann (eds. ), Syntax: An International Handbook of Contemporary Research, 826–846. Berlin: Walter de Gruyter. Silverstein, Michael, 1976. Hierarchy of features and ergativity. In Robert M. W. Dixon (ed. ), Grammatical Categories in Australian Languages, 112–171. Canberra: Australian Institute of Aboriginal Studies. Sorace, Antonella. 2005. Syntactic optionality at interfaces. In Leonie Cornips & Karen Corrigan (eds. ), Syntax and Variation: Reconciling the Biological and the Social, 55–80. Amsterdam: John Benjamins. Sorace, Antonella & Francesca Filiaci. 2006. Anaphora resolution in near-native speakers of Italian. Second Language Research 22, 339–368. Sorace, Antonella & Ludovica Serratrice. 2009. Internal and external interfaces in bilingual language development: Beyond structural overlap.  International Journal of Bilingualism 13(2), 195–210. Stemmer, Brigitte, 1999. An on-line interview with Noam Chomsky: On the nature of pragmatics and related issues. Brain and Language 68(3), 393–401. Teleman, Ulf, Staffan Hellberg & Erik Andersson (eds.). 1999. Svenska Akademiens grammatik, vol. 4: Satser och meningar. Stockholm: NordstedtsOrdbok. Tsimpli, Ianthi & Antonella Sorace. 2006. Differentiating interfaces: L2 performance in syntax–semantics and syntax–discourse phenomena. In David Bamman, Tatiana Magnitskaia & Colleen Zaller (eds. ), 30th Boston University Conference on Language Development, vol. 2, 653–664. Somerville, MA: Cascadilla Press. Tomlin, Russell S., Linda Forrest, Ming Ming Pu & Myung Hee Kim. 1997. Discourse semantics. In Teun A. van Dijk (ed. ), Discourse as Structure and Process, 63–111. London: Sage. Valenzuela, Elena. 2006. L2 end state grammars and incomplete acquisition of Spanish CLLD constructions. In Roumyana Slabakova, Silvina Montrul & Philippe Pr´evost (eds. 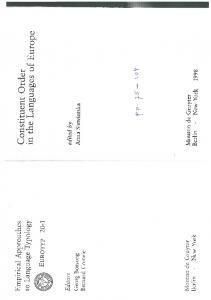 ), Inquiries in Linguistics Development, 283–304. Amsterdam: John Benjamins. von Stutterheim, Christiane. 2003. Linguistic structure and information organisation: The case of very advanced learners. In Susan Foster-Cohen & Simone Pekarek Doehler (eds. ), EUROSLA Yearbook 3, 183–206. Amsterdam: John Benjamins. von Stutterheim, Christiane & Wolfgang Klein. 1989. Text structure and referential movement. In Rainer Dietrich & Carl F. Graumann (eds. ), Language Processing in Social Context, 39–76. Amsterdam: North Holland. Weber, Andrea & Karin M¨uller. 2004. Word order variation in German main clauses: A corpus analysis. 20th International Conference on Computational Linguistics, 71–77, Geneva. White, Lydia. 2009. Grammatical theory: Interfaces and L2 knowledge. In William C. Ritchie & Taj K. Bhatia (eds. ), The New Handbook of Second Language Acquisition, 49–68. Leeds: Emerald. Zifonun, Gisela, Ludger Hoffmann & Bruno Strecker et al. (eds.). 1997. Grammatik der deutschen Sprache, vol. 2. Berlin & New York: Walter de Gruyter. 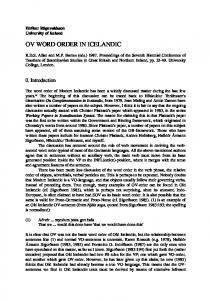 Report "The clause-initial position in L2 Swedish declaratives: Word order"